Bangladesh Skill Development Institute, an affiliated institute of Bangladesh Technical Education Board, organised a Book Distribution Ceremony for the students of Diploma in Engineering Programme of different disciplines of 2012-13 session. The programme was organised in a festive manner where the Secretary of Bangladesh Technical Education Board, Dr Abdul Huq Tahulder was present as the chief guest. The programme was chaired by the Director of the Institute, KM Hasan Ripon. BRAC University is going to offer a four year Bachelor of Social Sciences (BSS) degree in Anthropology from January, 2013. Anthropology is the study of culture that includes understanding of the state, political economy, gender, kinship and family, religion, language, environment and health at both national and global contexts. The programme therefore offers intensive course work covering theoretical advances and practical experiences, extensive field work, research with faculty members, internships with research organisations and NGOs, participation in workshops and conferences and career planning advice for graduate studies and for employment opportunities in research organisations and the private sector. Interested students can contact Admissions office at BRAC University (66 Mohakhalai C/A, Dhaka 1212) or visit bracu-anthro@bracu.ac.bd. 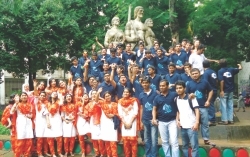 The 4th Year students of MIS (Management Information Systems) - BBA 15th batch, University of Dhaka celebrated RAG day on November 6, 2012. The programme started at 10 am at the premises of Faculty of Business Studies with consent of honourable teachers. The rally started from the faculty gate and went through the campus area. They wore colourful dresses and collected t-shirts signed by their classmates as a symbol of friendship. A cultural programme was organised by the 4th batch of MIS. East West University Club for Performing Arts (ECPA) organised a two day long Intra University Performing Competition on November 6, 2012 and Annual Cultural Night 2012 on November 8, 2012. The different segments of the competition were Band Song, Classical Song, Instrumental, Drama, Dance and Recitation. The chief guest of the annual cultural night was Professor Ahmed Shafee, Vice-Chancellor of East West University. The cultural night started with the distribution of certificates and crests to the winners of Intra University Performing Competition. Department of Law, Northern University Bangladesh (NUB) arranged a discussion on 'Rule of Law' on November 7, 2012 at its campus. Professor Dr Abu Yousuf Md Abdullah, Chairman, Nub Trust, was the chief guest. Justice Syed Abu Kowser Md Dabirush-Shan (Retd) attended the discussion as a guest speaker. After the discussion, a day-long annual cultural programme was organised by the department. Professor Dr Abu Yousuf Md Abdullah said that rule of law is the one of the most important concern to establish democracy and good governance. The institute of Business Administration, University of Dhaka, was crowned as the Champion at the recently concluded East West University Debate Spree, 2012. It was the most competitive national English debate championship at the university level this year. The tournament featured the participation of 44 teams from debating powerhouses of all universities in the country. For the first time in a local tournament, the debate motions were set in consultation with international judges and debaters online. The award giving ceremony was presided over by Dr Farashuddin, former Governor of Bangladesh Bank and Head of the trustee board of East West University. The Finance Minister, Abul Mal Abdul Muhit, M P, was the chief guest of the event. The Bangladesh Nari Sangbadik Kendra (BNSK) in association with the Eastern University held a seminar on, 'Women in Creative Profession' on November 10, 2012. Eminent writer Selina Hossain was present as the chief guest while Vice-Chancellor of the Eastern University, Professor Nurul Islam presided over the discussion. Professor Nazrul Islam, Dean, Faculty of Business Administration, EU, delivered the welcome speech. Among others, Professor Dr AB Shahidul Islam, Member, Board of Trustees, EU, Nasimun Ara Huq (Minu), President, BNSK, and Parveen Sultana Jhuma, General Secretary, BNSK, Dr N K Natasha, News Presenter, Machranga Television, spoke as the special guests. "Ad Maker Bangladesh, 2012,' the ad making competition organised by North South University Young Entrepreneur Society (NSU-YES!) 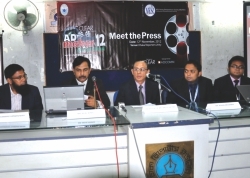 is back with its glory—it was announced at a press conference held at Dhaka Reporters Unity on November 12, 2012. Dr Md Abdus Sattar, Vice-Chancellor (Acting), North South University presided over the press conference where Belal Ahmed, Deputy Director and Head of PR, NSU, Mohammad Hannan Miah, Faculty Advisor, Reshad Mohaimen, President, and Md Omar Faruq Khan, General Secretary of NSU-YES!, delivered speeches. NSU-YES! approached total 50 universities (including both public and private) from all over Bangladesh. The event will kick off with a workshop providing basic and in-hand knowledge of advertising to the participants. Through Round 1 and Round 2, successful groups will be selected to participate in the Grand Finale which is going to be held on December 12, 2012. The top three teams will be awarded with trophies and prize money of Taka one lakh.